Accelerated Marketing – aka Auction – Sellers Need Options! 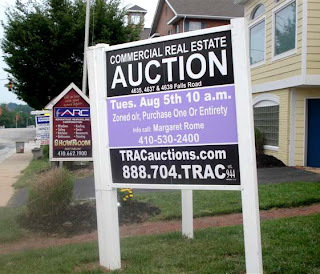 There's a popular perception that "Auction" = "Distressed Property." That's a holdover from the Depression and the downturn of the 1980's, but no more true today than the idea that direct mail is the only way to advertise. In reality, "Auction" can mean "Non-contingent, cash deal, no closing costs, commissions protected." Doesn't that sound better? Bidders at an auction know they are going to pay only what they have to and are comfortable with, and sellers know they will get the best price possible. The point is, a creative and qualified auction company can create a buying audience of qualified buyers, build interest, and create urgency. It's not unusual to see four houses on the same street for sale, all about the same. It's hard to sell in this situation as buyers play one against the other. But suppose three of the houses have realtor signs out front, and the fourth has an auction sign. That house is proclaiming it will be sold at a specific time on a specific date. As a potential buyer, why would you not come to that sale? We humans love to get a better deal, and "Auction" says we have a chance at doing better than bargaining with the owners of the other three houses. In fact, that's exactly what happened yesterday. As you can see, there are several real estate signs including one auction sign for three properties. Yesterday morning we held the auction and two of the three properties sold. Many Realtors® are not familiar with the options available with auctions, and so don't offer them to their clients as an alternative. Auctions allow you to customize terms and conditions the way you and your seller want them, and there are different types of auctions to choose from. Why not put the auction tool in your real estate toolbox? Well I had a policy back then: No Blind Dates. My social calendar was full. I said to Sandy, "If he’s such a catch why don’t you go out with him?" She answered, "I would love to, but he wont even give me the time of day." So I was intrigued, and wondered how she ever talked him into calling me? We made plans for Tuesday for a late date to go out for a drink. Why waste an entire evening on a blind date? If we didn’t like each other, we would only have to spend a short time together. But then my plans changed. A former boyfriend, Steve, who I had not seen for almost a year, came into town and stopped by my Pediatric clinic. Now I knew this guy, I really liked this guy and I was still interested. He was just in town for the day. So we made a date for Tuesday…yep, that same Tuesday night. So I had to call Lee and tell him about Steve and ask if he was interested in Thursday night. Lee thought he was out of a date, but I think intrigued that someone would actually break a date with him. He agreed to Thursday night. Well Steve stayed in town another day and then another and asked me out for...you guessed it…Thursday night. Again I broke a date with Lee. We finally went out on Friday night for a late drink and what we both thought would be a short date. We wound up closing up the joint. We talked for hours. Lee and I dated for almost two years! But he said he would not marry again, would not use the word "love," would not buy another house, and was not interested in having another child. Now understand that I was a Pediatric RN, I adored kids, and wanted four boys! Two years we went out together, and two years I continued to see others. The more together we were, the less I wanted to be apart. My friends were telling me to "fish or get off the yacht." I knew that an ultimatum would not be the answer and I was not willing to push him away. I thought I would have this talk with him, but one evening when Lee showed up instead I began to cry. This was a first, he had never seen my tears and it upset him. He spoke the now famous words, "You have to let me get used to loving you." I remembered that "Love" was a word he thought he could not use again. So how does this relate to real estate? Be prepared. Listen to those signals. There are many ways to CLOSE the deal. Are you listening?? 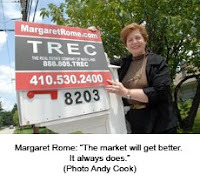 Here's the lead line of the article in today's Baltimore Jewish Times: "It takes a certain kind of personality to be a real estate agent, and Margaret Rome thinks she has the right type." The article goes on to talk about my new book, about my Type E personality, about the CyberStars®, and my particular approach to real estate. Please take a minute to read the article here. I'm loving it, of course! But it didn't just happen – this kind of coverage in a weekly newspaper that gets delivered to my market area did not just fall into my lap. I've been a regular advertiser with the Jewish Times for years and have built relationships there. Some time ago I told one of the people I know at the paper about my book. She told someone else about me and my book, and before long I was talking with Maayan Jaffe, a delightful young reporter. That conversation lasted for more than an hour and I did whatever I could to provide her with information that would help with her article. I rearranged my schedule to meet the paper's photographer at one of my properties. And when the article came out, there was my picture at the top. Two other agents were quoted later in the article, but at least 2/3 was about me. We've said it before – in real estate, building good relationships is the key to success. And sometimes, the key to getting great coverage that your clients, prospects, and friends will see, too.